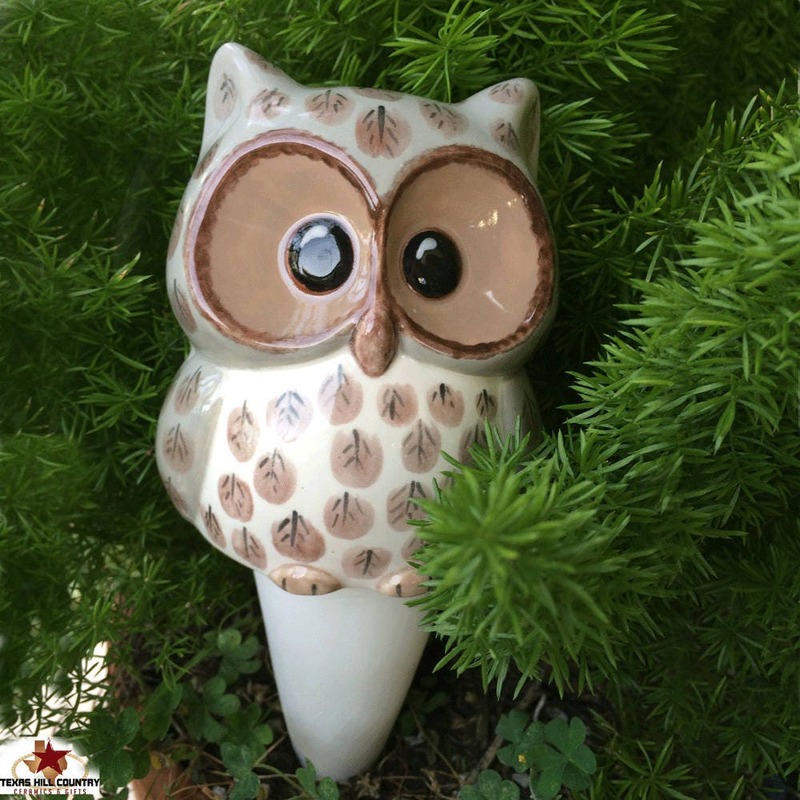 This large ceramic owl plant tender will help keep outdoor garden flower containers or indoor potted plants watered without constant attention and help to avoid overwatering and soggy soil. 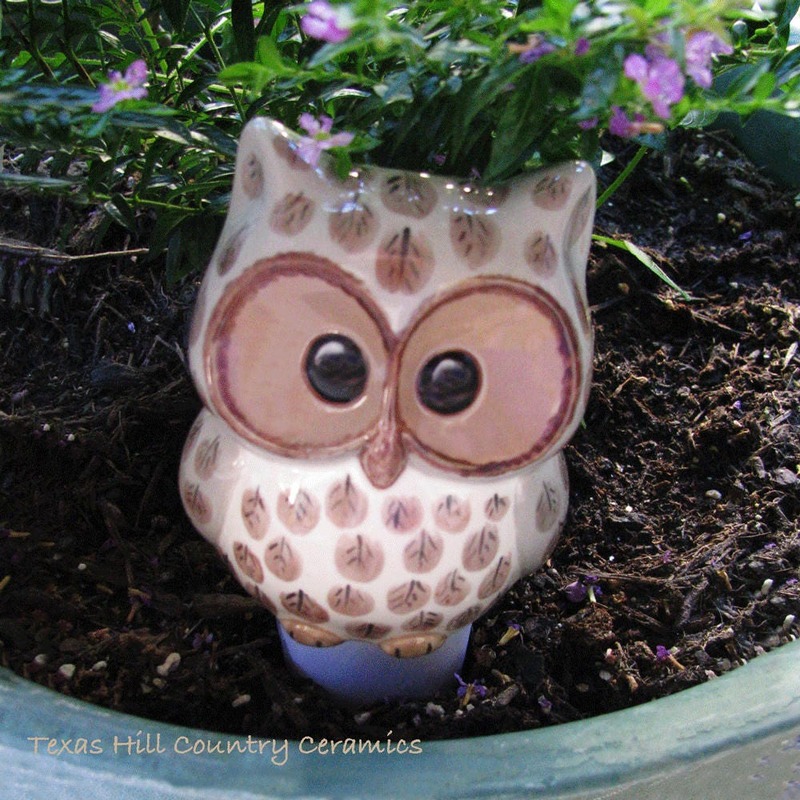 This eco friendly owl plant tender is a new style I have made, it is larger in size. 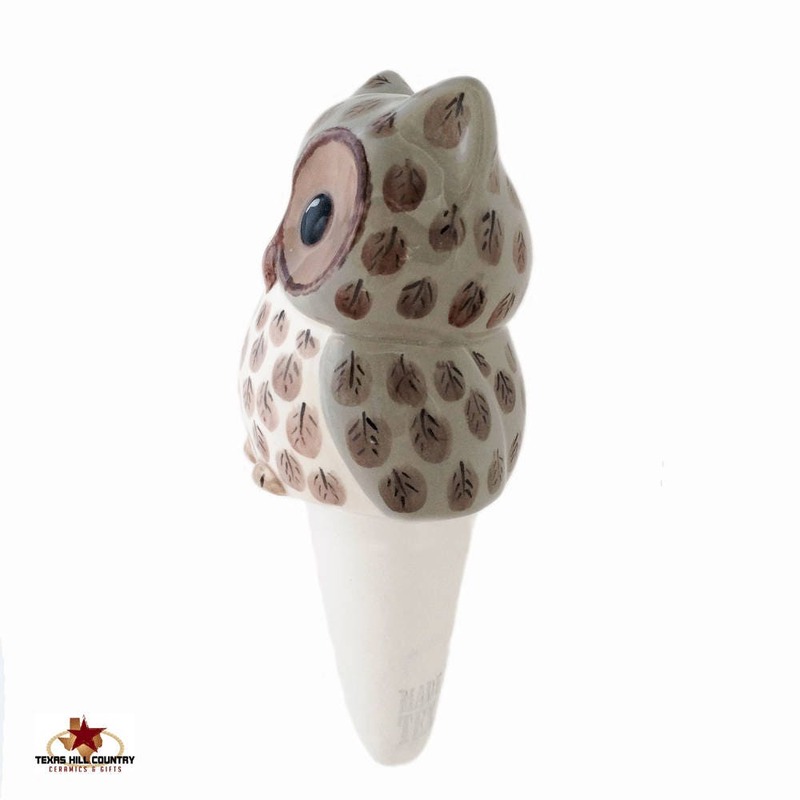 To use this owl hydro spike simply insert the cone into the dirt and fill the body reservoir with water the opening is at the back. The soil will absorb water through the porous spike, just refill the reservoir with water when needed. Plant tenders also help keep plant soil moist while away. 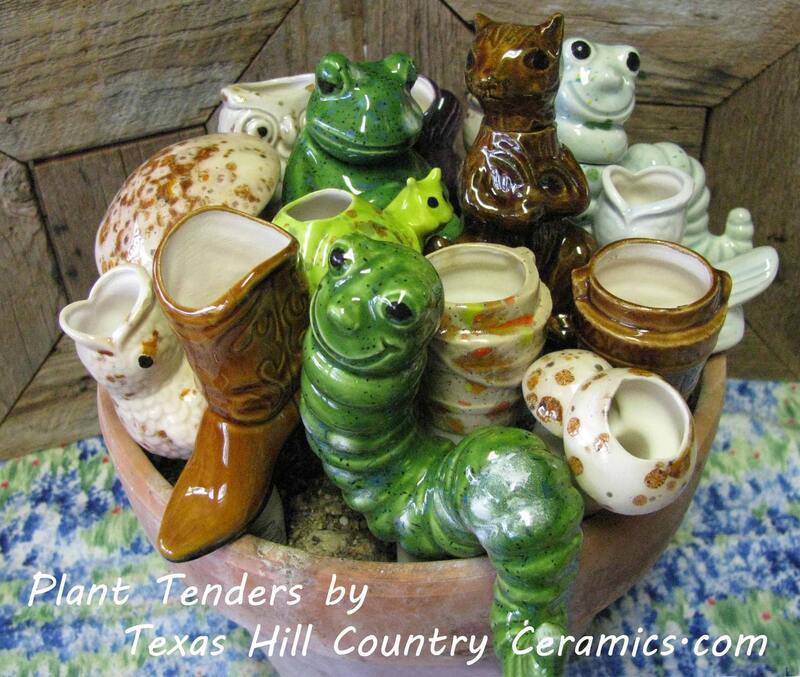 All plant tenders are hand made using domestic ceramics and kiln fired. Each piece is finished with lead free glaze. 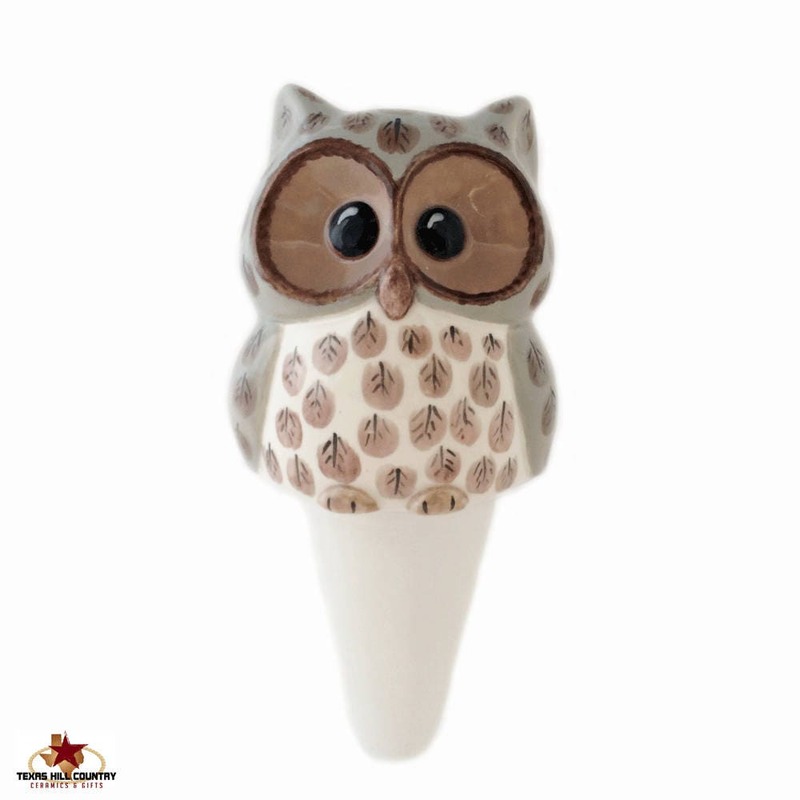 The color of the owl is a combination of beige, soft white, brown tones and black. The feather detail is created with brush strokes sometimes double and triple loading the brush with multiple colors. Please keep in mind each one is hand painted and has its own individual characteristics. • Payments are accepted in US dollars for the exact amount of the purchase, no exceptions. • Payments are processed at the time order is placed. • All orders are shipped via the United States Postal Service (USPS). • The SHIPPING & POLICIES tab located below each listing photo shows the current make ready time needed to create and complete your order. • Orders are shipped when finished. • International orders: Due to US Federal Regulations all orders shipped will indicate “Merchandise” on the USPS Customs Declaration form. • All ceramics are double boxed for the best protection. • Shipping includes a nominal amount to cover the cost of shipping supplies***. • customs duties/fees levied by their respective countries. • providing accurate shipping addresses when placing orders. • for reshipping costs as well as any return fees associated with the return of the package due to inaccurate shipping addresses. • Items will reship once they have been received back and new shipping costs are paid. • Orders are shipped via USPS with tracking. • Notification & tracking* is sent at the time orders are shipped. • Please provide a secure area for receipt of your order. • Large orders may require signature confirmation, you will be notified if required. If your package is shown as "delivered" and you have not received it please contact me ASAP. I will give you the info needed to research your package through USPS. The post office takes mail theft very seriously! • transportation • plus other items that may be needed to prepare your order for safe shipping. •	If you need to return an unused, undamaged item please contact me via the Etsy convo system within 3 days of receipt of goods to obtain instructions and a Return Authorization Number (RAN). Buyers are responsible for any return shipping costs. d: returned within 7 days of the original delivery date to be eligible for refund. If the item returned is not the original item sent or damaged in any way, the buyer is responsible for any loss in value. •	Refunds will be issued for merchandise only (minus restocking fees*) using the same payment method used to make the purchase. •	*Returns may be subject to a restocking fee, the fee may be waived on a case by case basis. Ceramic items that have been used are not eligible for return. •	Custom items are not eligible for return. *DAMAGED ITEMS - What to do: Should something happen to your order or one of the items in your order please contact me within immediately (no later than 3 days after receipt) for instructions. Also, your help is needed in getting the proper paperwork to the postal service including damaged items. Photos of the damaged package and contents are needed. You must not throw away any of the damaged item(s), boxes or contents including bubble wrap, etc. These items will need to be surrendered to your local post office, you must hold on to them until the claims process is finalized. •	Refused shipment/Unclaimed Returned Orders are subject to a restocking fee plus all return shipping cost incurred. Restocking fees are 10% of the order. • Buyers Remorse: Cancellation requests for online purchases are determined on a case by case basis. Shipping to EU countries is no longer available. You may want to consider using a forwarding service located in the USA which will forward the order on to you. Texas Ceramics is a registered business in the state of Texas and is required by law to collect sales tax on all purchases shipped to a Texas address.